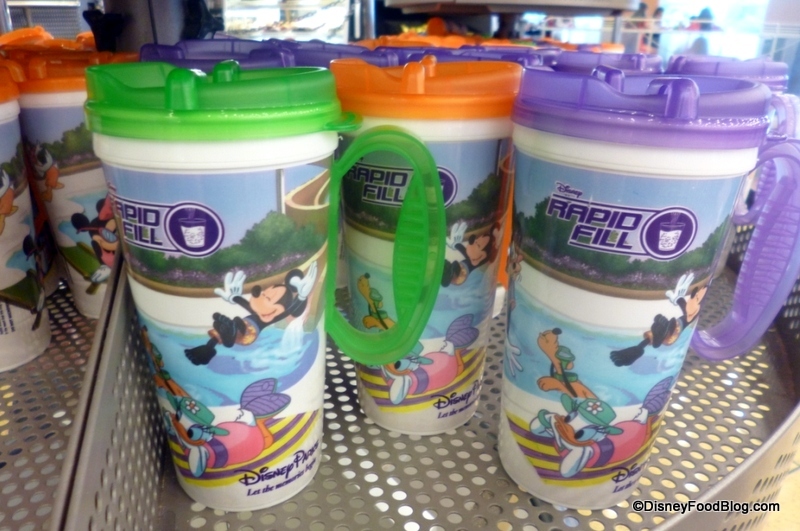 Welcome back DFB author Wendy with an informative report on the new Rapid Fill Resort Mugs in Walt Disney Word. At the time of this writing, the mugs are in use at Disney’s All-Star Music Intermission Food Court and All-Star Movies World Premiere Food Court. (Disney’s All-Star Sports End Zone Food Court is currently closed for refurbishment). 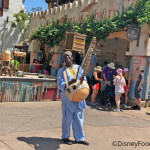 They will be rolled out at the rest of the Disney World resorts shortly. As you may recall from a previous post on Rapid Fill Refillable Mugs, Rapid Fill allows Disney Resort guests to buy (or receive as part of the Disney Dining Plan) a Resort mug which can be refilled for a certain period of time as designated at time of purchase. These mugs are enhanced by an RFID bar code which enables the mug to deactivate when the designated time is complete. Perhaps you have some questions… I know I did! So, let’s get started! What do the new mugs look like? Guests can now choose from orange, purple, and green lids for the mugs (previous choices included blue, black, and bright pink). 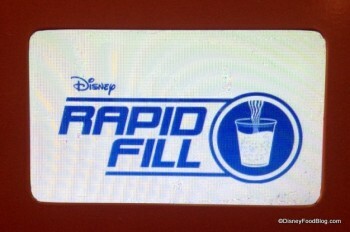 The Rapid Fill logo has been added to the mugs. 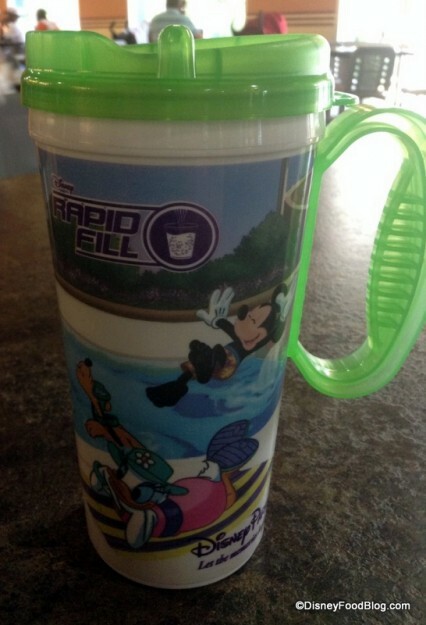 Where can I fill my Rapid Fill Mug? The text would seem to have answered that question. 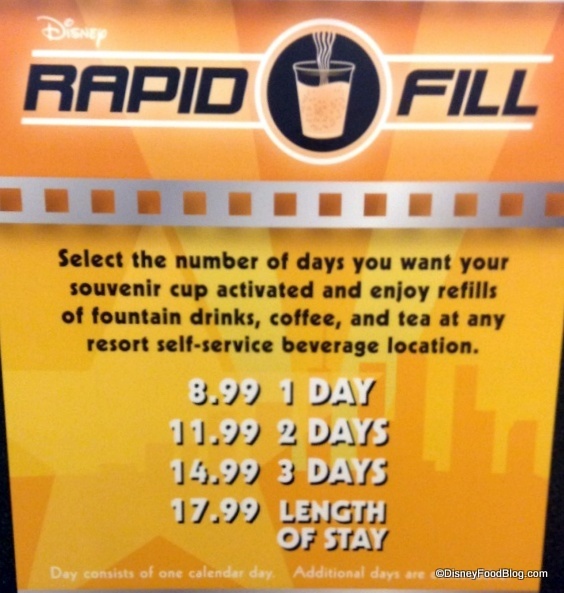 However, both the price signs and one of the Cast Members I spoke with indicated that Rapid Fill mugs can be used at “any resort self-service beverage location,” as long as they are used within the designated time frame. First, you’ll purchase your mug and indicate to the Cast Member how long you wish to use it. I chose a “One Day”, green mug. I like the new bright colors! 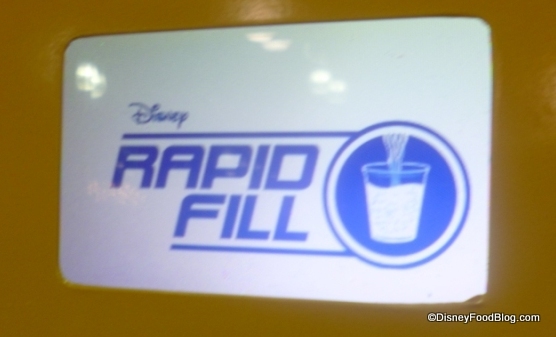 Next, you’ll go to the Beverage Island where you will see the Rapid Fill machines. You’ll know they are “Rapid Fill” by the little screens above the beverages. Pay attention to these – you’ll learn why momentarily :). Then, place your mug on the tray beneath your beverage of choice. It MUST be on the tray. Otherwise the machine will not recognize your mug. This is where those little screens start their big job. If your mug isn’t properly placed on the tray, the screen will indicate this to you. Once your mug is in place, press the button for your beverage of choice! 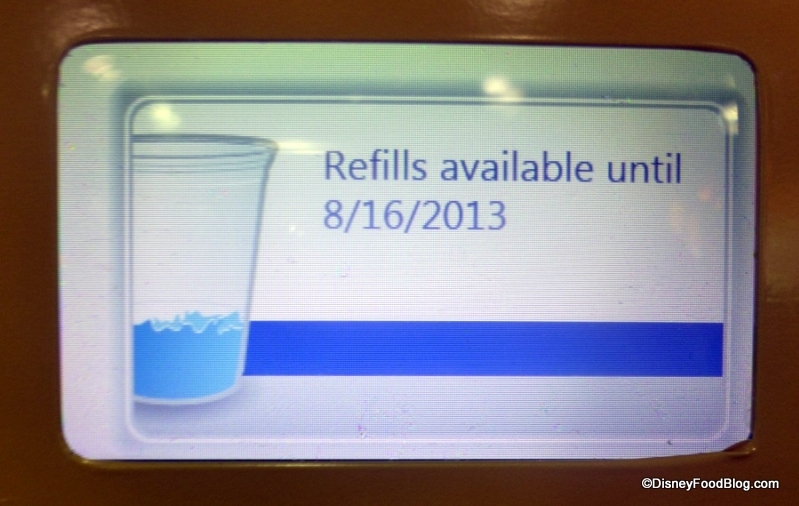 While your mug is being filled, the screen will display the date that your mug may be refilled through. You’ll know when your mug has reached its capacity because the screen will say “Fill Complete.” (You’ll also know this because your mug will start to overflow 😉 ). Wow… I’m so thirsty that I downed an entire soda in 1 minute and 43 seconds! 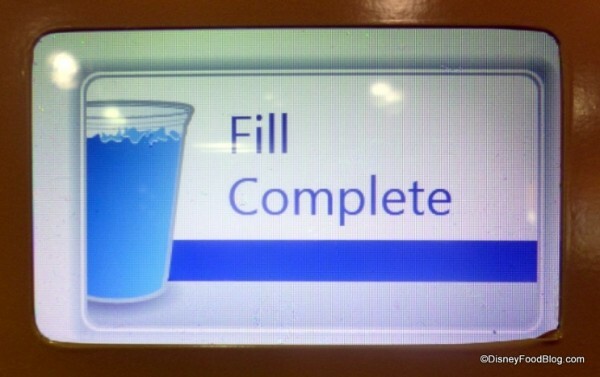 Can I refill again RIGHT AWAY? 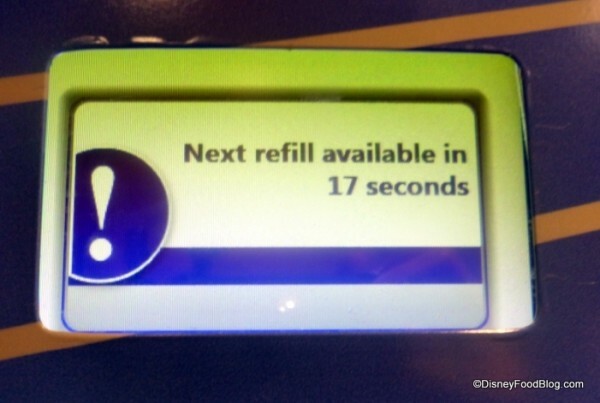 How much longer until my next refill? Okay. I’ve waited my allotted time. What now? I like to mix different beverages to make one drink. Can I still switch it up? Me, too! I like to fill my cup with three quarters Pomegranate Lemonade and one quarter Sprite. 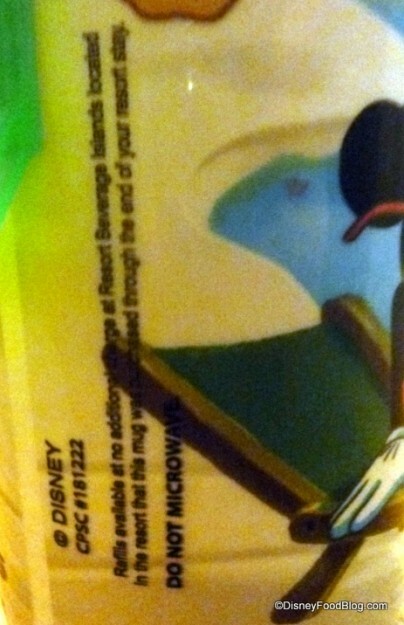 This is my own personal recipe for my Disney Mocktail (you’re welcome 😉 ). Yes, you can still do that, right up until the “Fill Complete” message appears. What if I’m just a kid and not tall enough to read all those screens? I don’t drink very much soda, but I enjoy one every now and then. What are my options if I choose not to purchase a Rapid Fill mug? You can still purchase a regular paper cup. 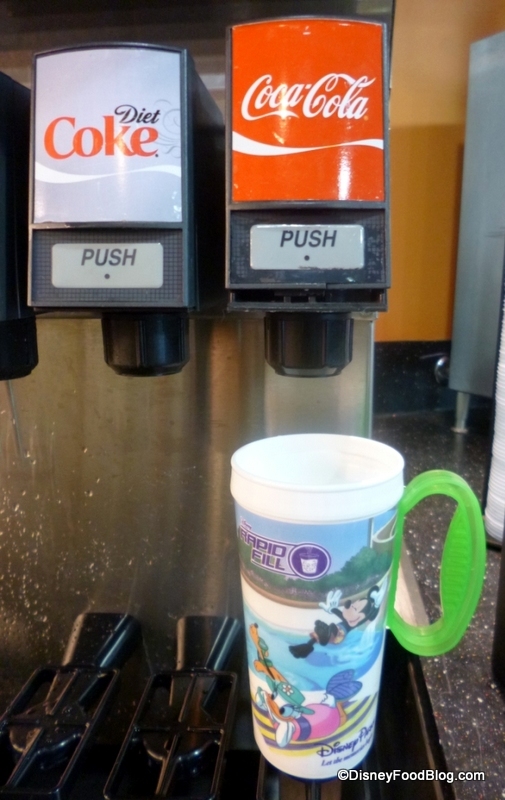 I spoke with a couple of guests who chose them, and their cups were read by the machines as well. However, the screens displayed different messages. Upon the first fill, the message read, “3 refills within 1 hour” (then “2 refills,” and so on). 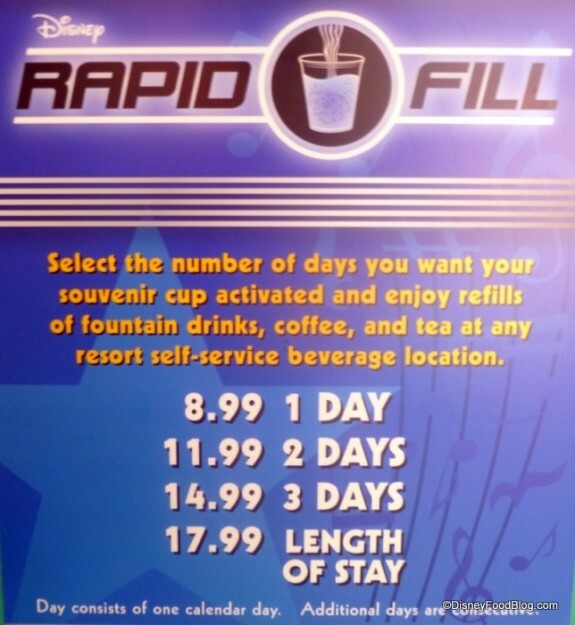 The cups deactivate and can’t be refilled after one hour, or after 3 refills – whichever comes first. What about water and ice? I brought along a water bottle that was not connected to this program. As of this writing, water and ice remains free for all cups. Whew! So, there you have it! 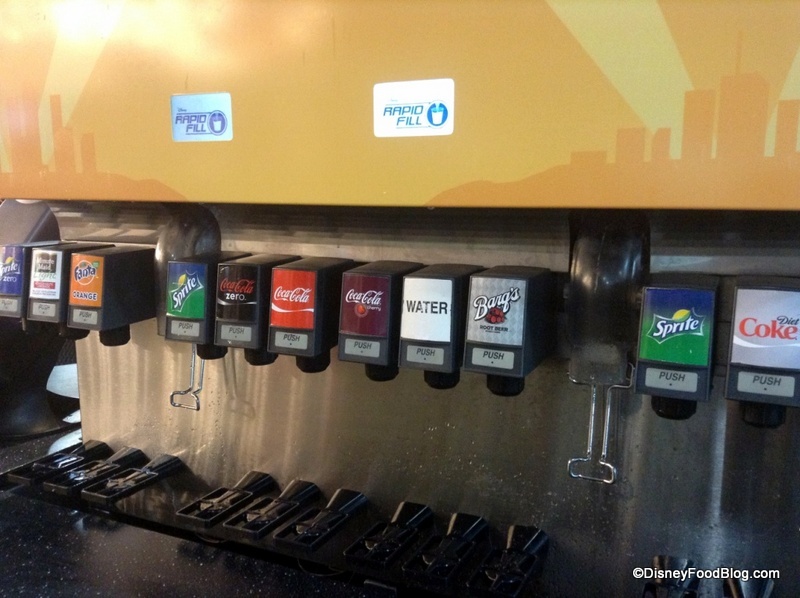 We’ll be keeping an eye out to see if Rapid Fill Beverage Stations become operational in more Disney World Resorts over the coming weeks. Share your thoughts on the new Rapid Fill program — let us know what you think in the comments below! News! 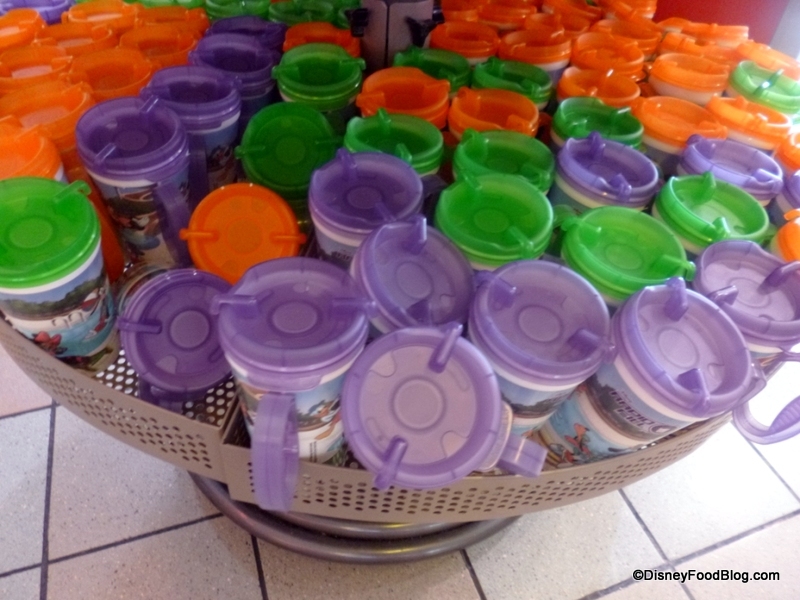 Redesigned Refillable Mugs at Disney World Resorts! 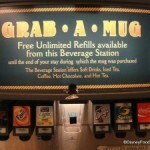 I am confused about this refillable mug deal. We purchased refillable mugs on our first family visit where we stayed at the Contemporary . When we bought these we were told we could always bring back these mugs for free refills on subsequent trips. I understand that you have a new plan now and that is fine but I hope to hear that you are honoring the agreement you made with us when we bought these mugs. This is totally unofficial, and purely speculative….. This article is more than 2 1/2 years old. I think Disney has changed pricing, etc a number of times since this was published. I think it is a one price/stay mug now. The new mugs have a chip in the bottom with a date embedded. 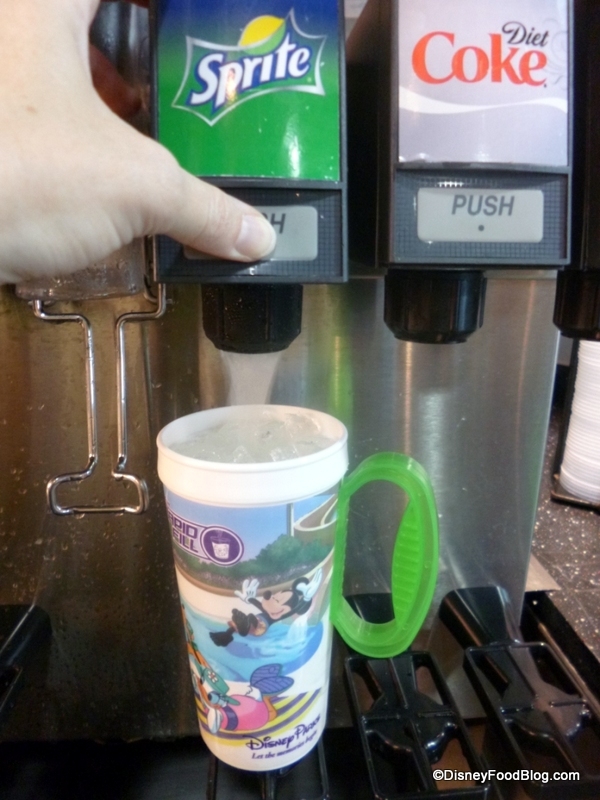 The only way to get the pop (soda) to dispense is via the activation and utilization of the chipped mug and the system within which it works. Curious… when did you get your mugs??? 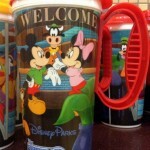 Can you use the refillable mug that comes with the dining plan for coffee at your resort? Margaret — Yes, you can use it for the coffee that’s served at the mug refill stations. I also bought the refillable cups in one of my visits, and the people of the staff told us that we could bring them back every subsequent visit to the resort, which I did my next two visits, even the cup model was changed. 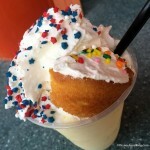 My question is, this summer I’m coming back to the same resort (Coronado Springs), can I bring my cups? Unfortunately , No Gabby. The machines will ‘look’ for the chip, and when it does not read the right information from the bottom of your mug, it will not dispense soda. The chips are programmed with your date of stay right on the chip. So when you put the cup under the dispenser and press the start button, it will show your expiry date. I bought a mug on my stay in April 2017 under the impression that I could bring it back on subsequent trips. On my recently completed stay in February 2018 it worked perfectly well. Has the policy changed? John, lucky you. I can only assume that you either were not using your mug at chip dispensing machine, such as coffee, tea,hot chocolate, iced tea, etc. 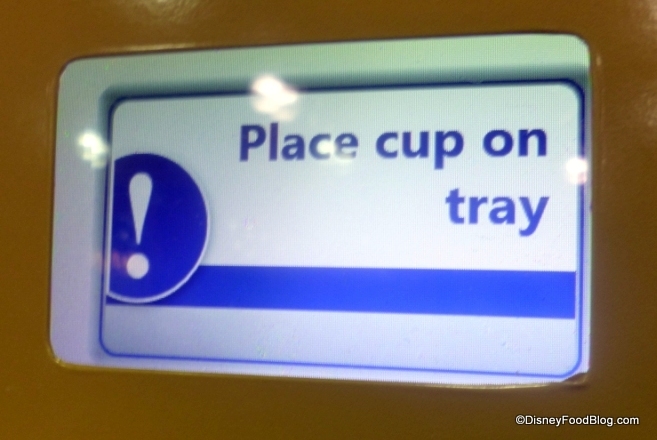 OR there was an issue when your cup was chipped OR the machines were not reading correctly. My mug was programmed incorrectly in Dec. It was programmed for 2 days instead of 14 days. It did not work at the ‘machines’ after 3 days, and I had to go back to the cashier to have it ‘fixed’. So I am staying at POR in August. We are on the dining plan the first of our stay but added 2 days on after the first trip was booked. I’ll be at the same resort, no break in my stay. Will my mugs work the whole trip or just part of it? Danielle, you should be able to use them for the full length of stay.